I admin a few groups on Facebook. One is called the Lymphie Strong Inspiration Group, and the other one is called The Lymphedema Running & Fitness Club. The inspiration group is for general lymphedema discussion, and the other obviously focuses on exercise and fitness. 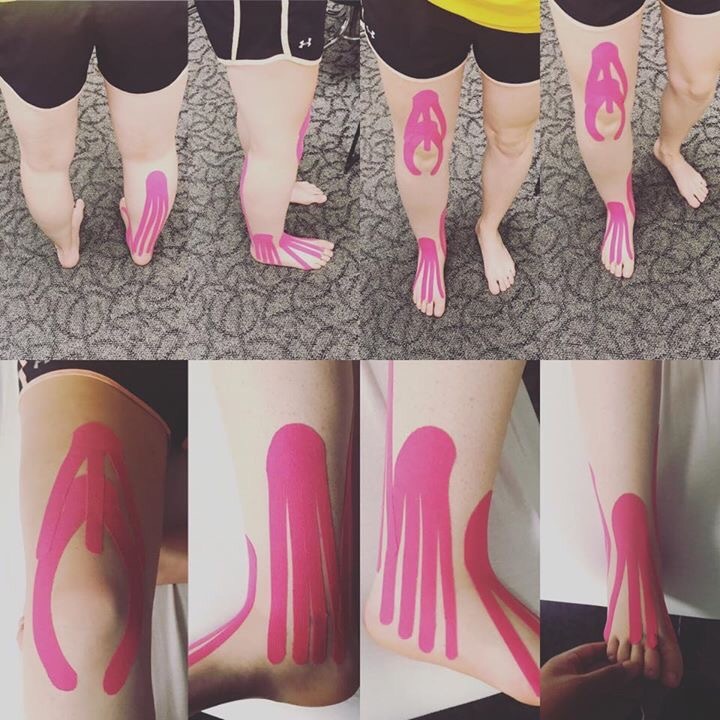 In BOTH groups, however, we talk about a tool in our Lymphedema Toolbox known as kinesiology tape. The photos used in this blog post are from individual members of both groups. They have given my website the express rights to them along with permission to use them as examples for the purposes of education. Any reproduction without their permission is not allowed. I know. I know. 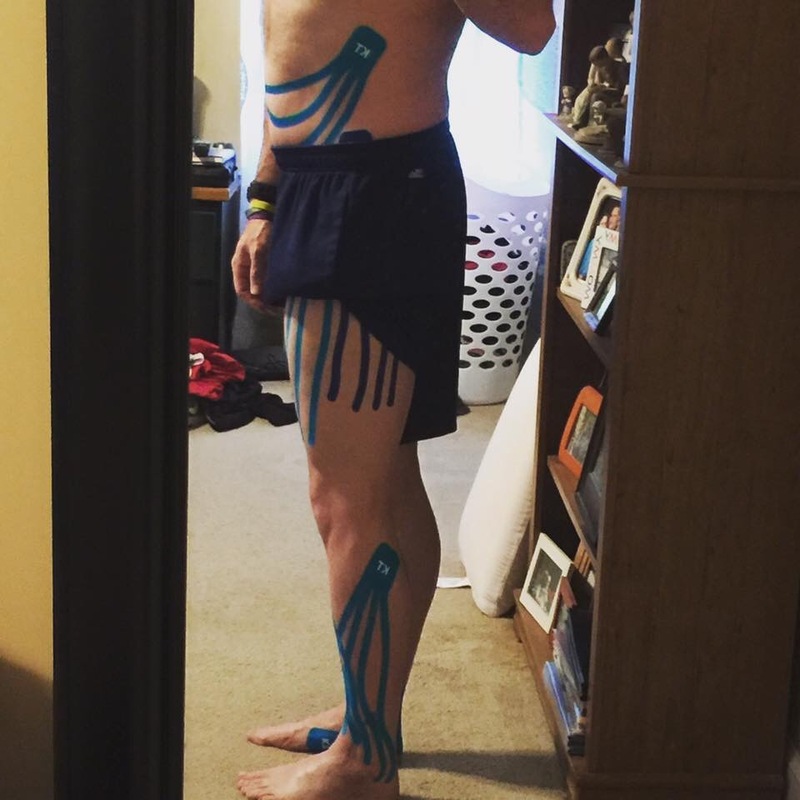 You take one look at that crazy tape on my legs, and you’re probably thinking a lot of things. I was very skeptical myself at first. It sounds and looks a bit like what my father would say was hogwash. In fact, the first time I tried it, it was an epic fail for me. I saw no use for it at all. 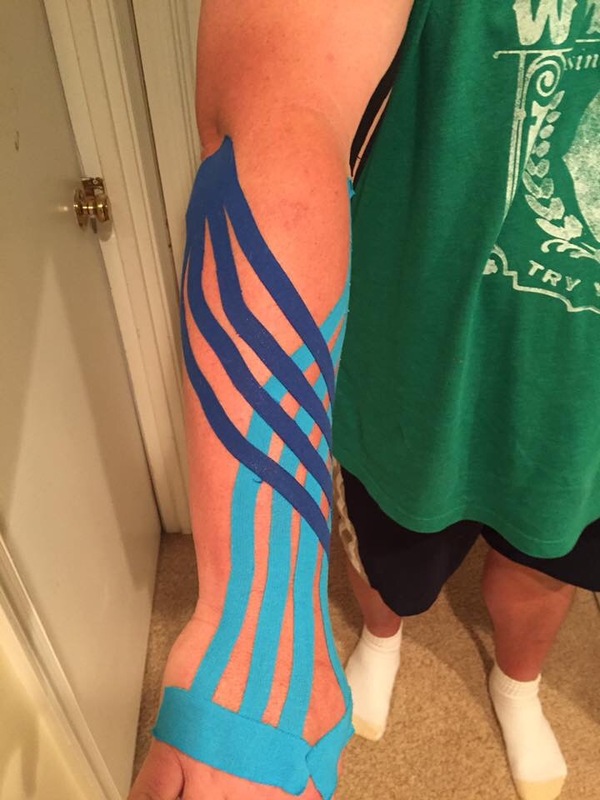 At the time, my certified lymphedema therapist was not certified in kinesiology taping, so it was mainly guesswork. A year later, she had taken a class to get certified, and we got down to business. I experienced a huge difference in results and feeling from wearing it. 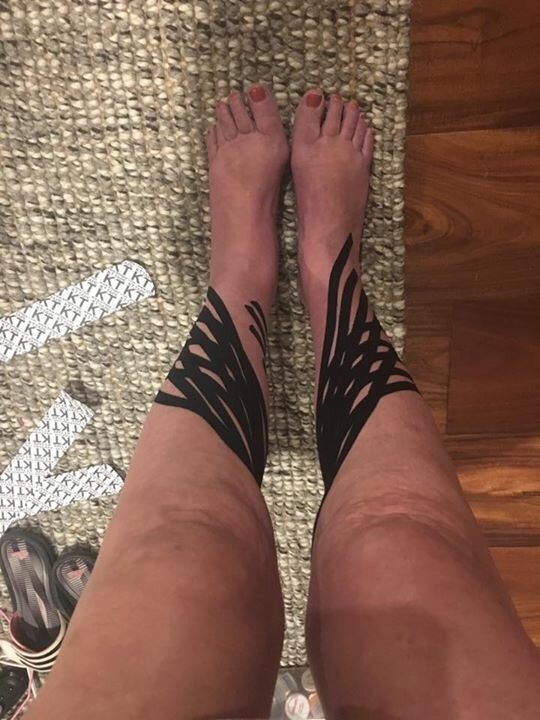 Every time I post photos of this tape on my body, I inevitably get a response like “I’ve had lymphedema all my life and never heard of such a thing.” Still skeptical? 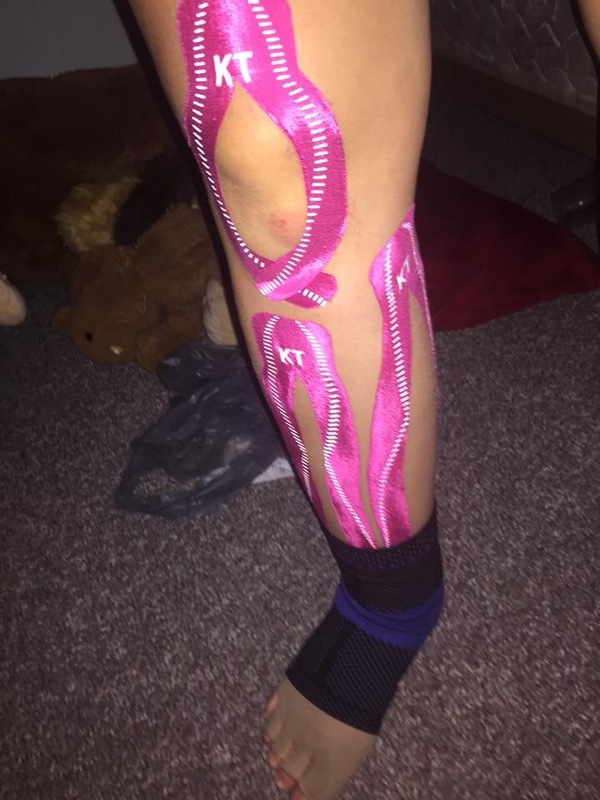 I challenge you to do a web search on the keywords “olympic kt tape images.” Go ahead, open up a separate page and do it. Let’s just pause here while you do that. What does this do for Lymphedema? Think of it as “real time” manual lymphatic drainage. The catch is you have to move. 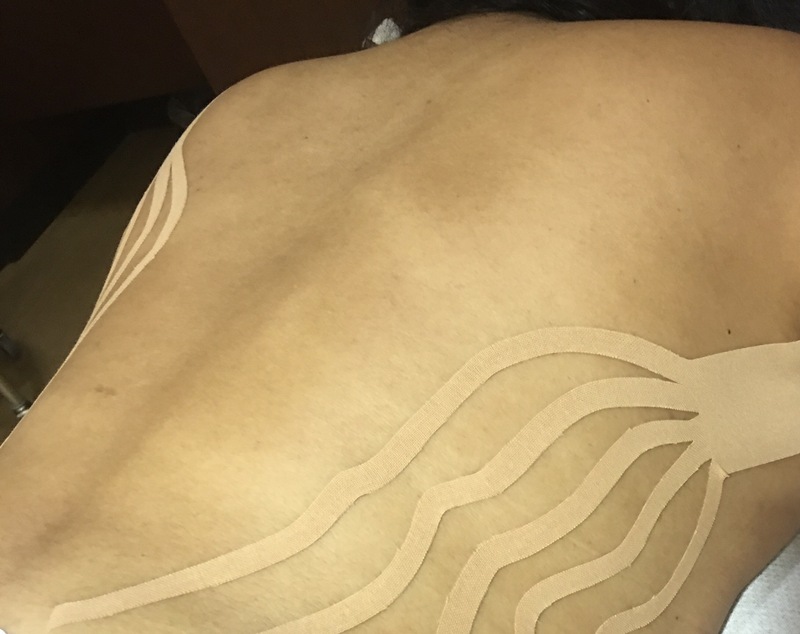 Just slapping some tape on your body and laying down is not likely to do much unfortunately. How do I know if it will work for me or is it guaranteed? NO. There is no guarantee. 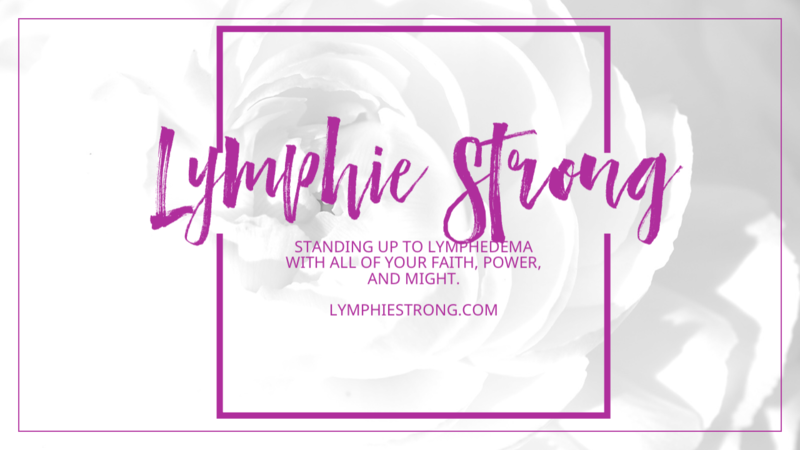 Like with all things lymphedema, it’s trial and error. A lot of people are ALLERGIC to this tape or to the adhesive unfortunately. If you have skin sensitivity issues, you probably want to test an area first before applying to a large part of your body. VERIFY ALL CONTRAINDICATIONS to using this tape before trying it. Ask your CLT or other trained medical professional. As stated above, I first learned from my CLT who took a class to get certified in taping specifically for lymphedema. 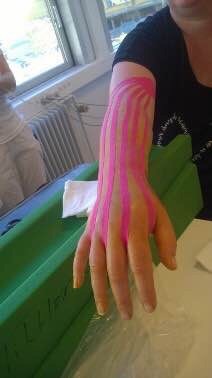 There is also a great book Kinesio Taping for Lymphoedema and Chronic Swelling – Kinesio Taping is a registered trademark. There is a manual and a textbook. The manual from Amazon is cheaper than the actual textbook. Prepare for sticker shock. As with anything for lymphedema, it is fairly expensive. You might want to put it on a wishlist or birthday gift list. However, I can’t stress enough how valuable this manual has been to me when I finally saved up and purchased it. 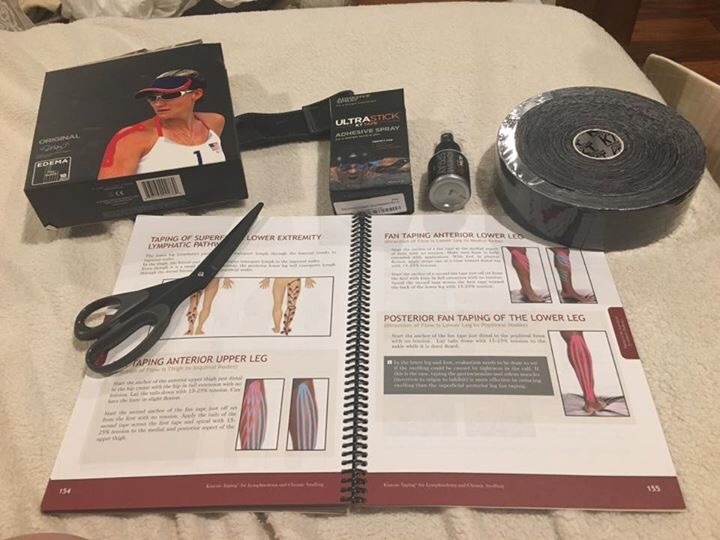 Here is a photo of a member who purchased the manual, a bulk roll of KT TAPE Original Cotton Elastic Kinesiology Theraeputic Tape – 150 Pre-Cut 10″ Strips by KT Tape, the KT Tape Kinesiology UltraStick Adhesive Waterproof Spray by KT Tape, and of course scissors for cutting her strips. Some people use a barrier like Milk of Magnesia and let it dry. Do we take it off or keep it on for a shower? It’s completely fine to leave it on for showering or in the pool. How many days before you have to take it off and redo, roughly? Eh, I typically leave it on for 5-7 days. It will start to peel on its own, and you can simply trim off the edges as they become ratted or are hanging off. Be VERY CAREFUL when taking it off. If you have skin integrity issues, you can tear your skin if you rip it off too fast or rough. Think of a waxing pain without the heat. Ouch!!! I once got a piece caught on my truncal LE vest and when I took it off, it ripped an entire strip up my back! Think of ripping a long band aid off. Ugh! How should this be applied? Well, that’s completely up to your certified lymphedema therapist and YOU. Don’t be afraid to experiment with different techniques and applications. As shown here, there is probably an infinite amount of possible applications depending on your goals and needs at the time. Can this be done on the arm? Have you heard of it for other parts? Arms? Trunks? Of course! You can even put it on your face!! See examples for abdomen, arms, and back below. The lady with the pink strips on her arm actually broke that arm. 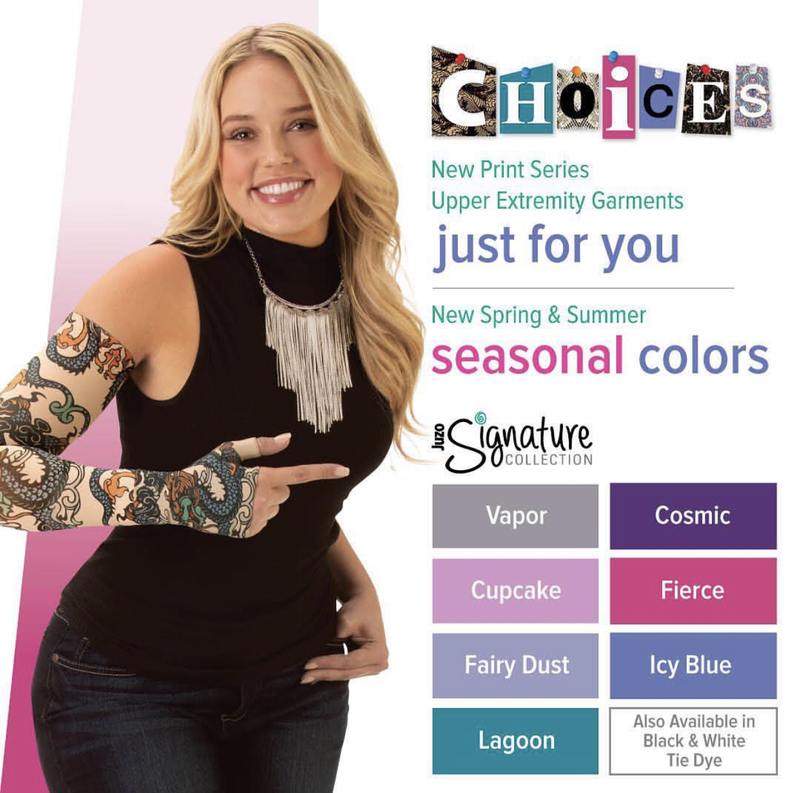 Her other arm has LE. She applied her LE knowledge and used tape to control the swelling on the broken arm. Cool, huh? Where can I buy the tape? I buy the tape at Academy or Amazon. Any sporting goods store would have it. Different brands stick differently on me. The one my CLT uses only lasts about 2-3 days, and it’s supposed to be the “best” one. Again, it’s all trial and error with experimentation. Don’t be afraid to try different brands or even different colors. Hehe I love using colors!!! 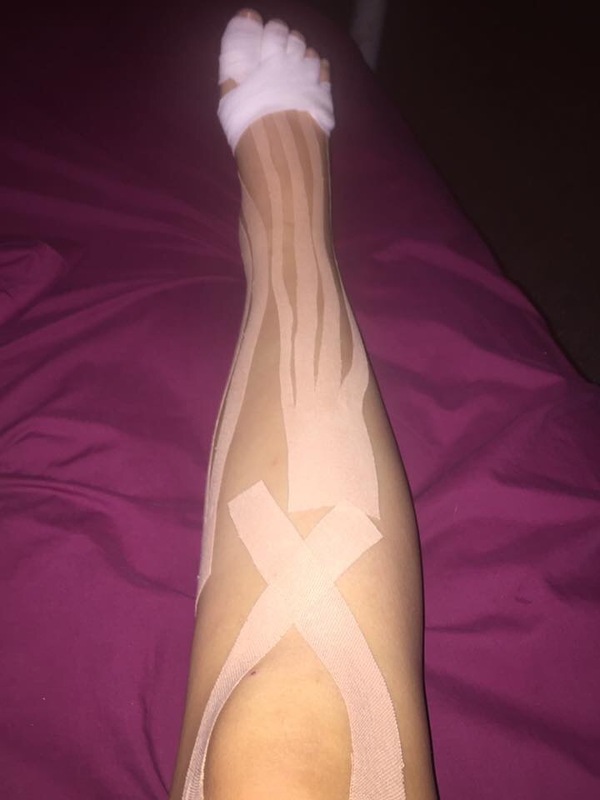 Does the tape stay correctly at the leg/foot juncture when walking or moving around? YES. No different than a band aid. Do you do the taping instead of wrapping? Um, that’s tough one to answer. Again, depends on your situation. I use mine in conjunction with wrapping and compression stockings, because I’ve had LE for 23 years. My main use is to use while running and extra support on very hot days. Everyone is different. You can certainly try to do it, but the risk is all on you. I did a video on it. 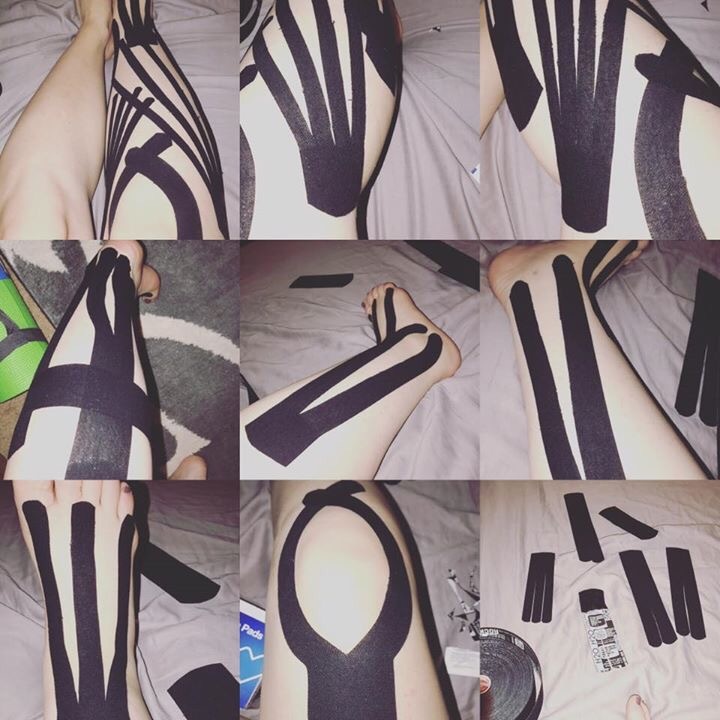 – > https://staylymphiestrong.com/2016/12/31/lymphie-strong-kt-taping-for-lymphedema/ It’s my own thing and not found in any book. Feel free to search for videos on taping. There are tons. These are basically the most frequently asked questions on taping that we see most often in online support groups. If you have any others, feel free to drop in the comments below. As always, we wish you great lymphatic health. 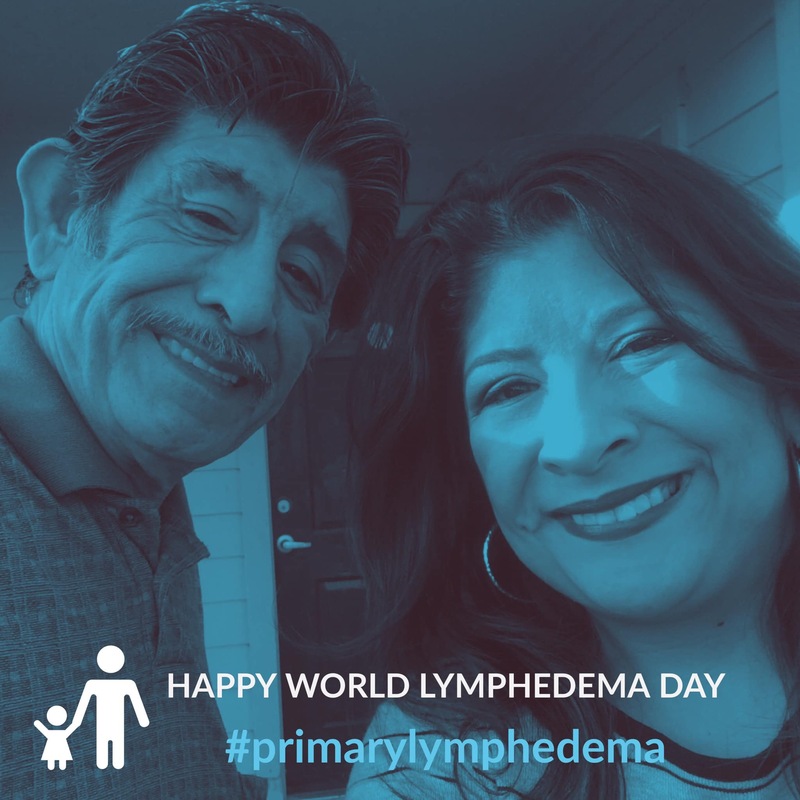 What Would You Do If You Lost All of Your Lymphedema Compression In A Natural Disaster Like Hurricane Harvey? Lots of great information. Just a commitment on taking it off. I but baby oil on it and then kept putting baby oil with a cotton ball on the area of the tape and skin touched and it came off with out hurting. My CLT suggested using oil. I had some baby oil in the house and it is cheap. I use coconut oil for removing for a vegetable alternative to petroleum product… my hubby is petroleum sensitive from the well fires in Kuwait. Different colors react differently with my skin and some areas are more sensitive than others. The neutral shade works best for me. Pink irritates me a lot…too bad, I love that shade. Wow! I’m inspired now to try taping. Thanks so much for sharing your experience! You write in such a straight-forward casual but informed way, I always look forward to reading your posts. Great info! Been dealing with bilateral lymph for 30 years. It has been getting worse every year. My doc figures I am carrying 30 lbs in each leg.